Japanese junipers are a popular tree for bonsai. 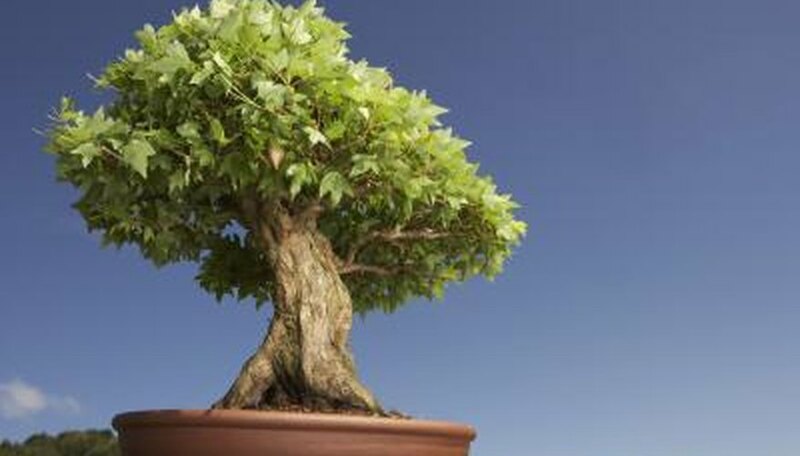 Bonsai is the art of keeping miniature trees in small, flat pots that mimic the characteristics of large, old trees. Although junipers are popular and quite hardy, sometimes things go wrong. If you notice your juniper turning brown, it is important to quickly establish the cause. Needles turning brown can be an indicator of improper watering. Junipers don't need water every day. In some cases, overwatering can cause needles to turn brown. However, inadequate water is also often the cause of a browning of your tree. Never allow your juniper to completely dry out. Allowing the tree to dry out often results in root death. If the roots die, the upper portion of the tree, including the needles, won't get enough water. Many popular home and garden stores sell junipers with a layer of rocks glued on the soil. This layer of rock is glued in place for the convenience of the store and wholesaler and offers no benefits to your tree. In fact, if you don't remove this layer, the glued rock layer will kill almost all of bonsai trees you bring home. If you buy a tree with these glued rocks, remove them by breaking them up gently with a hammer. Replace them with loose aquarium gravel that allows air and water to circulate freely. Junipers can sometimes turn yellow if left in full sun. In some lights, this yellowing may appear brown. Keep your juniper in indirect light or in partial sun to encourage its deep green color. Unfortunately, if more than one branch is brown, your tree may already be dead. Junipers tend to remain green, even after death. In some cases, by the time your tree turns brown, it may already have been dead for several days or weeks. If only a single branch is brown, consider pruning off that branch and waiting to see what happens with the rest of the tree.